On November 6th, California voters passed Proposition 30, deciding that it’s time to invest in our state’s future again. As a result, California schools and services can begin to recover after years of budget cuts. The wealthiest Californians will pay a fairer share of taxes to support the common good. Proposition 32 failed. Working people and their unions will be able to continue to participate in the political process. And anti-union, anti-public education billionaires will have to wait for another day to again try to mislead a majority of the electorate to vote against their own interests. California Federation of Teachers (CFT) members contributed actively in the campaigns for Prop 30, against Prop 32 and for many local initiatives and candidates, reaching out especially to young people, immigrants and lower-income communities of color. AFT 1493 members played a role by phone banking with the San Mateo Labor Council and distributing campaign materials and talking about election issues with colleagues and students. At right are reports from CSM and Skyline about tabling activities on those campuses. What will Democrats do with supermajority? Another significant outcome of the election is that the Democrats gained a supermajority in the California Legislature. They are in an historic position in which they can pass legislation that Republicans have blocked for decades; however, it is not clear what actions they will be willing take. In a recent editorial in the San Francisco Chronicle, CFT President Joshua Pechthalt wrote that it’s time for the Legislature to “hold a rational conversation about what services Californians need, how much they would cost and how we pay for them.” He suggested a couple of “conversation starters”: an oil severance tax and the replacement of the two-thirds vote required to pass local tax measures with a simple majority vote. We also believe it is critically important to broaden the discussion on how to stabilize the state economy with adequate services and revenues. On page 8 we are publishing an article that presents numerous possible revenue raising proposals that could prevent the need to continually cut public services. We hope other Advocate readers will further this discussion by sending us additional viewpoints on these issues. – Ed. 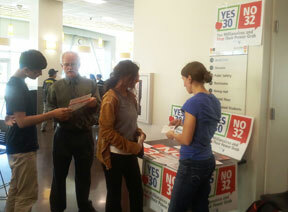 We spent almost two weeks tabling for the Yes on Proposition 30 and No on Proposition 32 campaign this past October and November at CSM. Setting up and getting flyers was complicated and busy work. It did not help that we temporarily lost our intrepid Executive Secretary, Dan Kaplan, to family business the very week we started. However, once we were sitting at our table, with stacks of flyers and well-versed on the propositions, students seemed eager to talk to union members, to hear what it is we do and what our role is in the political sphere. They see us as teachers on campus and in classrooms, but talking about immediate issues that affect all of us together was different, but very rewarding. We had many productive conversations at our table in Building 10 on the CSM campus, where there is a great deal of passing foot traffic and where people gather to eat and study in groups. The table was made lively with signs, brochures, pamphlets and later Prop 30 bracelets and Halloween candy for interested and hungry potential voters. On the last few days of our tabling event, we were joined by members of the Student Senate, who brought with them a new and electrifying energy. Many of the people we spoke to were students, some voting in their first election. These young voters were daunted by the number of propositions found on the California ballot and had many questions about what they all meant. It was a pleasure to see such interest not just in Propositions 30 and 32, but in the other propositions as well. Our discussions ranged from how different propositions involved social justice and working people to how many of them twined together in related ways. Some students talked about how cuts in education funding has caused some communities to be more affected by laws such as the death penalty and the three strikes laws, both of which had reform initiatives on the ballot. With fewer people acquiring quality primary education and even fewer able to access secondary education to achieve the dream of a fulfilling career and profession, more people are committing crimes to survive. Many students were also asking questions about the effect corporations have on the food supply as well as the political process of ballot initiatives. This brought up discussions of the food labeling law, Prop 37, as well as the effect a corporate-sponsored law like Prop 32 could have on silencing the voice of working people and organized labor in future elections. There also were conversations about the notoriously backwards language of California initiatives, which often appear to be saying one thing, when they are really saying the opposite. Seasoned voters who knew the ropes offered guidance to new voters. At times, we felt more like the facilitators in a lesson on democracy, rather than the informers of important issues and policies. One of the most common questions for us was about how to register and locations for polling. The young people I spoke with also displayed an eagerness in finding information about laws and law-making, using smartphones to look up websites like Ballotpedia, Smartvoter, and the California Secretary Of State guide. Michelle made a few do-it-yourself items for our table, one of them being a couple of cards with barcodes that would bring people to a link when scanned with a smartphone, one for the CFT website with the union’s recommendations on the propositions, and another for the California SOS page with information on polling places and checking registration status. These were snatched up and tucked into pockets along with our leaflets, the bracelets, and candy. Among the greatest pleasures were hearing from students who were not yet 18 and could not vote, but were still vitally interested in what the issues were and how the percentages looked for different initiatives. Hopefully, with the expansion of same-day registration in California in 2013, many “too-young” students who have their birthdays after the initial registration cut-off date will get an opportunity in future elections to impact progressive policies. If we do tabling again for the 2014 elections, it would be cool to see if we could start in time to give students an opportunity to register to vote, as well. We met many new people, shared information and many interesting conversations, we encouraged people to believe in the democratic process, and were encouraged by people whose excitement over the election was contagious. We received praise for our efforts, pats on the shoulder, and thanks for the candy, which apparently helped keep many folks awake in their night classes. We laughed, and then we voted. In the end, Prop 30 passed and Prop 32 was defeated, Obama won, and you all know the rest. Time well spent. 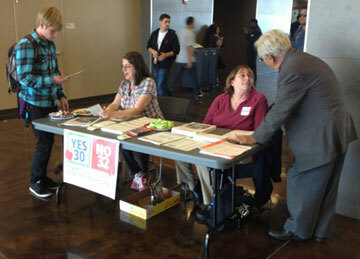 Thank you to all who met with us at the Yes on Prop 30/No on Prop 32 table! There was a lot of collective nail biting in schools and unions leading up to the November election. None of us was certain about the outcome of Prop 30 or Prop 32. Even with the victory of Prop 30 and the defeat of 32, it was a pretty close call. Prop 30 won with 53.9% of the vote and 32 lost with 56%. At Skyline, a few of us decided to do a “guerilla” tabling campaign the week before the election. Eric Brenner and I started on the Thursday before the Tuesday election, spending a little over an hour in the cafeteria. We returned on Monday, enjoining the help of professors George Wright, History, Garry Nichol, ESOL, and Sarah Powers, Language Arts, in a relay of table-staffing that lasted about three hours, from 11:00 a.m. to 2:00 p.m.
On that first Thursday of our campaign, Eric and I found a stray cafeteria table, and with the help of a student, moved it to a strategic location: the intersection between two busy entrances to the building, directly across from the café and kitty-corner to the food-service area. We were along the path to the college bookstore and the stairs to the Associated Students Office and the Building 6 meeting rooms. I brought campaign materials provided by the CFT, a roll of sticky tape and a bag of leftover Halloween candy. We quickly taped a large sign to the wall and a couple more to the table itself and spread out the flyers, cards and candy. It was a busy corner. We worked it as a team, with handy information cards in our hands and friendly: “Are you voting in the upcoming election?” openers sliding off our tongues. It wasn’t easy, nor did it feel entirely successful. A good number of students just walked right past us, their focus on their plates of french fries and burritos. Some nodded but kept walking. Many responded by telling us they had already voted. Others told us, “I can’t vote”. We assumed they were too young, hadn’t registered in time or were not citizens. In fact, an interesting number of students we approached appeared as though they might not be citizens, judging from the mix of disappointment and sincerity in their voices when they spoke with us. A number of students did stop to take our materials. They showed some interest, but there was no urgency in their responses. Many staff and faculty members gave us the nod – yes, they knew about both propositions and intended to vote yes on 30 and no on 32. On the Monday before the election it was a whole different scene. The majority of students who stopped wanted to hear about the propositions, especially 32, which was not clearly represented in much of the election hype and needed to be explained. I found the students I spoke with to be polite, concerned and grateful to have the information. Again, staff and faculty rushed past to pick up coffee, food or get to a meeting on time, but nearly all of them gave us the special nod so we would know that they were with us on this one. We learned from this small but intense campaign that students are open to and appreciative of receiving information, and that we can play a positive role by just taking a little of our time to talk with them. We also learned that the urgency of a deadline (sound familiar?) creates a higher level of interest and engagement. The student vote from community colleges, CSUs and UCs around the state certainly contributed to the outcomes of these two seriously important propositions. I imagine many of us already know this, but our experience at Skyline reinforced the fact that we can, and should, inform and educate our students outside of the classroom as well as within. And free candy never hurts a campaign. The following viewpoint article presents ideas on how the Democrats in the Legislature could use their new supermajority to stabilize the state economy with adequate services and revenues. We encourage Advocate readers to submit other views on these issues. – ed. An historic opportunity to reverse decades of austerity has arisen in California after the November 6 elections. By passing the revenue-generating Prop 30, defeating the anti-union Prop 32, and sweeping the Democrats into their first super-majority in the state legislature since 1933, Californians expressed a clear mandate to reverse the past years of devastating cuts and fully fund public services. “Republican opposition” — the classic excuse given by the Democrats for failing to pass progressive demands — has been swept away now that the Democrats have the two-thirds in the legislature needed to raise taxes, propose constitutional amendments for referendums, and override Governor vetoes. This puts the Democratic Party, a party funded and controlled by corporate money, in an extremely uncomfortable position. Working people, students, and communities of color expect them to deliver — and will likely mobilize to make them deliver. High popular expectations can be a dangerous thing for the powers-that-be. In this context, the immediate response of both Governor Brown and Senate President Steinberg has been to immediately attempt to deflate expectations by declaring that they would not use their mandate to raise new revenue. Moreover, the Governor has announced that he wants large amounts of the Prop 30 funds to pay back the state’s deficit. Similarly, the heads of the UC and CSU systems — plus the Chancellor of City College of San Francisco, which remains under the gun of the accreditation imposition — immediately announced the need to march ahead with new tuition hikes and more cutbacks, despite the new increases in revenue from Prop 30. Nevertheless, an historic opening has emerged because working people have expressed a clear anti-austerity mandate, have raised their expectations for change, and have placed the politicians in Sacramento in a position that makes it significantly harder to reject the people’s demands without showing themselves to be allied with corporate interests. As always, it is only through independent organizing — including rallies, marches, occupations, and (most critically) strikes — that we can win anything substantial. As the first term of the Obama administration demonstrated, there is no reason to expect the Democrats to pass anything in the interests of working people on their own initiative. To achieve our goals, the broadest possible unity in action of labor unions, student and community organizations will be needed. A first step in this direction would be a statewide conference bringing together these forces to formulate a platform of common demands and an action plan to win them.The stakes are high. Since the 1970s, California has been in the vanguard of cutbacks and privatization — but now we have an opening to help California show the way forward for effective mass anti-austerity resistance. Let’s seize the moment. Introducing Salumeh Eslamieh, Cañada’s new Executive Committe Rep.
We have asked each of the new AFT 1493 Executive Committee members to briefly introduce herself in The Advocate. In the following article, Salumeh Eslamieh (photo below), Cañada’s new Executive Committe Rep., provides some background about herself below. -ed. The San Mateo County Community College District has been my home from the start of my teaching career. In 2004, I began as a writing tutor at Skyline College, and then I became a part-time faculty member. In 2006, I became a full-time member of SMCCCD, teaching English, Reading, and Literature at Cañada College. Activism and social justice have always been a part of my studies and interests, prompting my interest in teaching at the community college level. I am a graduate of UC Irvine, where I studied English and Women’s Studies, and San Francisco State University, where I earned a Master’s degree in literature (emphasis in postcolonial literature), a Certificate in Teaching Post-Secondary Reading, and a Certificate in the Teaching of Composition. During the last nine years, I have seen the pivotal part the union plays in all matters across campus, inspiring me to become an active member. I see the AFT 1493 Executive Committee as a very valuable committee to be a part of, and I am happy to be a resource for my colleagues. In 1996, AFT Local 1493 established its own Committee On Political Education (COPE) chapter. The San Francisco Bay Area Educators Credit Union handles the monthly contributions that our chapter receives from its COPE members. We have spent money from our COPE account in support of candidates who were running for the San Mateo Community College District Board of Trustees and who were endorsed by AFT Local 1493. In the past, we have also used COPE monies in support of statewide propositions and initiatives that the COPE Chapter had voted to support. Law prohibits us from using local COPE monies on Federal issues and candidates. It is difficult for teachers to influence elections in our county, but it can be done — with mailers, signs, and advertising — all of which requires money! In Fall 1993, prior to the establishment of our COPE fund, we assisted our two endorsed Board candidates in amassing over 40,000 votes each, which, unfortunately, was not quite enough to win. Subsequently, our COPE funds enabled us to mount a much more aggressive campaign for our three endorsed Board candidates in the November 1995 election. We were successful! Two of our three endorsed candidates were elected at that time. In 1997, we helped elect a third faculty-friendly, COPE-endorsed candidate to the Board. In 1999, an incumbent, whom we had not previously endorsed, sought and received the endorsement of our COPE chapter, and was successfully elected. Of course, this is rather ancient history now. But we are currently in the process of reactivating the AFT 1493 COPE Chapter with an eye on future Board of Trustee elections that will be coming up in November 2013 and beyond. Please help us continue this success in future campaigns. Join us by making a relatively painless, monthly contribution, via a deduction of $5, $10, $20 (or more, if possible) to our San Francisco Bay Area Educators Credit Union COPE account. Only AFT 1493 COPE members (that is, all faculty who have made a financial contribution to the AFT 1493 COPE Chapter) have the right to vote on which candidates, propositions or initiatives our COPE chapter will endorse. This is one way in which you can influence decisions that affect all of us. Joining the AFT Local 1493 COPE Chapter simply requires a faculty member to fill out a Credit Union deduction form. (If you already have a regular deduction for this credit union, then be sure to add that amount to the amount you want used for COPE.) It is also necessary to fill out a COPE authorization form. Please contact the AFT Chapter Co-Chairs on your campus for these forms. Once you have filled out these two forms, then please return them both to the AFT office at CSM (17-131) or call the AFT Office at x6491 if you would like more information. At a District Board meeting on Wednesday November 14th, the Trustees discussed the fate of the noncommercial television license they have owned since 1964 – KCSM TV. KCSM’s signal reaches 10 Bay Area counties and is broadcast on 60 municipal cable systems throughout the Bay Area. A request for proposals at the end of 2011 attracted six bidders, but at the end of October, the Board of Trustees formally rejected all the bidders, stating the two top bidders were unable to complete a sale. According to the District, FM Media, a division of the public media brokers Public Radio Capital, were unable to secure financing and San Mateo Community Television, an affiliate of Independent Public Media, an initiative to revitalize public media spearheaded by Free Speech TV co-founder John Schwartz, were unable to meet local control requirements. Bay Area community media advocates Media Alliance filed a public records request in April 2012 and after a six-month delay, secured the bid documents for public review. They are available on the Media Alliance website (media-alliance.org). The Trustees reviewed a presentation on a possible spectrum auction by the Federal Communications Commission, a process that is now entering the rule-making stage. The auction would repurpose broadcast spectrum and auction off unneeded spectrum to wireless companies. Broadcasters have excess spectrum after the transition from analog to digital broadcasting. The Community College Board proposed auctioning off all the station’s spectrum to wireless companies and issued an RFP searching for a for-profit partner to subsidize the station’s operating costs in full for the period leading up to the possible auction (anywhere from 18 months to 4+ years) and then split the proceeds after the station would be shut down. Rosenberg added that a review of the bid documents left her with some questions as to why the District refused the bid from San Mateo Community Television for $5.8 million dollars. When you signed your contract to work for a California community college, did you understand that you would lose claim to most of the Social Security benefits that you had paid into the system? Did anyone inform you that you would lose all claim to your spouse’s Social Security? The measure that takes away most of your Social Security benefits from your own contributions is the Windfall Elimination Provision (WEP). The measure that for most California teachers eliminates all claim to a spouse’s benefits is the Government Pension Offset (GPO). Congress implemented these two unfair Social Security measures in 1977 to prevent public employee “double dipping.” Just as nobody calls it double dipping to draw Social Security benefits along with a private-sector pension, public employees should not be penalized for contributing first to one plan and then contributing to another. Addressing the offsets requires congressional action. The Social Security Fairness Act, HR 235, introduced by Representatives Berman (D-CA) and McKeon (R-CA) in the House and S484, in the Senate, introduced by Senator Feinstein (D-CA) would completely repeal the WEP and GPO. The Committee for Social Security Fairness, grassroots and largely run by teachers, has been lobbying heavily to repeal the WEP and GPO. What can you do to help? Go to www.ssfairness.com to read more and join their mailing list. You will receive e-mails with updates and “action alerts,” providing quick links for you to send messages to congressional pressure points. As we move to more and more online communications, AFT 1493 surveyed District faculty members to find out members’ preferences for reading The Advocate—in print or online. Our online survey received responses from 173 faculty members. When asked how often and how much they read The Advocate, 43% (74) of respondents said that they “read most articles in every issue”, 24% (41) said they “read a few articles in every issue”, 11% (19) “read some articles in most issues”, 20% (35) “occasionally read a few articles in some issues”, while 2% said that they never read The Advocate. Do you read The Advocate in print or online? The central question, “In what format do you read The Advocate?”, yielded a very mixed response: 38% of respondents (65 faculty members) said that they just read print copies, 20% (35) said that they just read The Advocate online, while 42% (71) said that they sometimes read print copies and sometimes read online versions. When we asked how their Advocate reading would be affected if the print version were discontinued and only online versions were available, 67% (113) replied that they would still read it the same amount, but 29% (49) said that they would be less likely to read it and 7 respondents said that they would stop reading it entirely. What could we do to improve The Advocate? In addition to getting data on faculty members’ Advocate reading habits, we asked one open-ended question: “What do you think we could do to improve The Advocate?” We received 35 responses to that question. Of those, 11 respondents (almost 1/3) just gave purely positive answers, such as: “I think that it’s great the way it is. Thanks for the hard work,” and “Excellent and informative! Thank you!” To those respondents, we thank you and we always appreciate positive feedback. Several responses asked for more information on specific issues, especially issues and data related to part-time faculty. Other issues that we were asked to cover more included: retirement; faculty evaluation; connections to other union issues outside our Local; and state-wide or nation-wide issues that relate to local, faculty-related issues. Another theme that came up in several responses was suggestions for how to highlight articles of particular interest to specific groups, such as more clearly separating articles for part-timers or retirees or highlighting the main points of articles briefly and providing links to details for those who want to read more. We are already planning to institute some of these suggestions in the very near future. We thank respondents for their feedback. The faculty who responded to our survey were quite equally spread between full-time and part-time faculty members and among the three colleges. 52% of respondents were full-time faculty while 48% were part-time faculty; 38% taught at CSM, 34% at Skyline, 22% at Cañada, and 6% taught at more than one of the District colleges. Additionally, 10% (17) of the respondents also taught at at least one other college outside our district. Those listed by more than one respondent were City College of San Francisco, Foothill, DeAnza, and Ohlone. The complete results of the survey are available here.